Microsoft has renamed its instant messenger client several times in the past ten years or so. Windows Messenger was the name of the program under Windows XP. Windows Vista users on the other hand worked with Windows Live Messenger. Both programs came preinstalled with the operating system. The Windows Live Messenger Uninstaller has been designed to completely remove Windows Live Messenger from the operating system. The program can be used to uninstall the initial version of Windows Live Messenger from the Windows operating system or uninstall another version of the instant messenger even if it is broken or otherwise damaged. 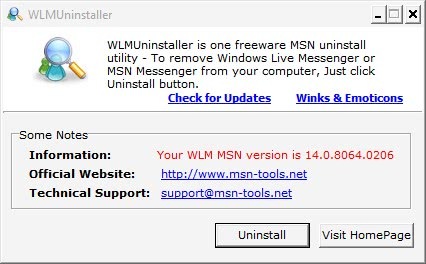 WLMUninstaller is pretty easy to use. Only one button needs to be pressed to uninstall Windows Live Messenger from the computer system. The program will start uninstalling Windows Live Messenger once the uninstall button has been pressed. It will display information regarding that process in the interface. Windows Live Messenger Uninstaller is a tiny portable software program. It can be downloaded straight from the developer's website. Update: Under Windows 7, the program is still called Windows Live Messenger, or simply Messenger. The latest official version of Windows Live Messenger Uninstaller is 1.0, which was released in 2009. It is likely that the program is no longer working correctly if you have never versions of the messenger application installed on your computer. While you can try to uninstall Windows Live Messenger with the help of the tool, I personally would not as it could have ill-effects on your system. Here are the uninstallation instructions to remove the Messenger application from Windows. In the Uninstall or change program list, click Windows Live Essentials. and then click Uninstall/Change. Click Remove one or more Windows Live programs. Select the programs that you want to uninstall, and then click Uninstall. In the Currently installed programs list, click Windows Live Essentials, and then click Uninstall. Note To completely remove Windows Live Essentials, select all the Windows Live programs. > Live Messenger on the other hand. There’s a message from the Redundancy Department of Redundancy in there. I am so happy this is the first program that actually repaired the ongoing problem i had with getting windows live off my system, there must have been a broken link somewhere but i uninstalled it but my pc still said it had windows live on the system! But this tool fixed it! Well impressed the guy who made it is a legend! I tried to simply uninstall windows messenger (using Add/Remove Windows on My Computer) and thought it worked until the next time I turned on my PC and now I have small pop ups(that won’t go away, in the middle of my screen, can’t even move them! arghhhh!!) that ask me to install the Photo Gallery as well as an error msg from .NET Framework – all extremely annoying! Any advice – I didn’t think I could use Ghacks as I had already “uninstalled” – keeps asking for install disks that I have no idea where they are – Please HELP!